Oops - we don't appear to have a video for the DR-2510M. 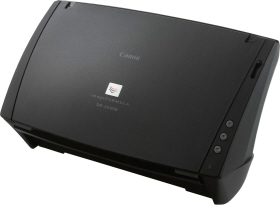 The DR-2510M space-saving desktop colour scanner, brings Canon's unrivalled performance and exceptional reliability in image capturing to the Mac platform. Delivering exceptional performance, the compact design of the DR-2510M ensures efficient use of workspaces. Strong and robust, the scanner is built to handle up to 1,500 pages per day – ideal for peak periods. The fastest, most economical and effortless way to manage your workgroup scanning, our innovative image sensor technology delivers the same highly productive speeds, whether your documents are black-and-white, greyscale or colour. For easy, mission-specific scanning, you can scan 25ppm (50ipm duplex). However variable the types of documents to scan – from rough textured paper to feint text – with an optical resolution of 600 dpi the scanned result will be of the highest quality. The DR-2510M also includes a range of features to enhance the legibility of documents and improve OCR accuracy to create perfectly searchable PDFs. Boost user productivity and scanning reliability further with a range of features, including Text Orientation Recognition, Auto Colour Detection and Canon's Rapid Recovery System. Save energy – and reduce costs – with the Energy Star compliant DR-2510M. Up to 50% more efficient than comparable rival models, the scanner can also be automatically switched on or off in line with the Mac it is attached to. A slanted straight thru paper path provides trouble-free scanning. From thin and thick, to embossed media including business cards, photographs and A3 documents (in folio mode) the DR-2510M can scan mixed document types with no special preparation. Canon's versatile CaptureOnTouch software is included for simple, productive one touch, quick scanning operation, including scanning direct to iPhoto. Additional features come from flexible applications like Presto! PageManager for organising digital documents and Presto! Bizcard 5, which can set up important contact information in a searchable database. Its also supports all Mac applications, such as iPhoto and Image Capture, through the included TWAIN driver.